Woman (identified as Siyuan Zhao) follows and proceeds to stab another woman (identified as Shin Seo Young) with an X-Acto knife at Art Basel Miami Beach. Fair organizers respond to the incident. More photographs of the scene are released. Page Six profile of Siyuan Zhao, who thankfully failed in her mission of killing three people. Christian Viveros-Faune thinks that Art Basel Miami Beach is degrading for art and artists. Art Fag City thinks that NADA Miami Beach was a disappointment. Tropical rainstorm pours on fairgoers and partiers and floods the streets of the city. Forbes thought that buyers at Art Basel Miami Beach used caution when buying. Artnet’s guide to the 20 art fairs during Art Basel in Miami Beach in 2015. NY Times has a general overview of this year’s Art Basel Miami Beach. Judd Tully does a video walk-through of the Art Basel Miami Beach fair. Artinfo’s 60 Works in 60 Seconds at Art Basel Miami Beach 2015 video. Andrew Goldstein choices for 10 of the best artworks from the Art Basel Miami Beach fair. Artsy’s list of the 15 best booths there. Brian Boucher highlights some works. Sandy Rower provides his choices for the 5 best works at the fair. Benjamin Genocchio highlights a few booths. Cait Munro spots 5 key trends. Artspace chooses 5 young artists that showed during the fair. The Horts share their picks from the Miami fairs. Alexander Forbes’ sales report from Art Basel Miami Beach 2015. Katya Kazakina also has a sales report and a followup one, as does Judd Tully. Eileen Kinsella claims to have the definitive report from the fair, as well as an update to that report. Marion Maneker collects sales data from multiple sources. Kenny Schachter’s coverage on the gossip, transactions, parties, and analysis of Art Basel Miami Beach. Scott Indrisek’s experience walking the fair and viewing works at Art Basel Miami Beach. He also shares his experience at NADA Miami Beach. Kevin McGarry recounts his time in Miami. Karen Rosenberg shares her picks for the 10 best booths at NADA Miami Beach. Brian Boucher picks his top booths at NADA. Michele Robecchi provides his artwork picks from the fair. Mark Beasley also shares his choices. Artspace’s list of artists to watch at NADA Miami Beach. NADA Miami Beach brings to light older artists that have not yet received major recognition. Andrew Goldstein shares his picks for the 10 best artworks at Untitled art fair. Dylan Kerr has his choices for the best of Pulse Miami. Trong Gia Nguyen is the winner of the 2015 Pulse Prize for his work at mc2gallery’s booth. Artinfo’s choices for the 5 best booths at the Art Miami fair. Noelle Bodick picks the 5 best booths at the Miami Project fair. Artnet’s highlights from Design Miami. Artinfo also visits the fair. Artspace interviews Robert and Nancy Mollers about their collection and experience and tips on NADA fairs. Franklin Sirmans discusses the future of the Miami art scene. Artnet highlights the private collections in the city. Scott Indrisek looks at other exhibitions that are in Miami during ABMB. NY Times profile of Martin Marguiles. James Capper’s Mountaineer Prototype, which performed in front of the Bass Museum. Ben Davis introduces ArtBlab, an art fair mutation of ArtSpeak. Cait Munro covers the Ryan McNamara and Devonté Hynes performance at PAMM. Rachel Harrison’s 58-part work, The Voyage of the Beagle, Two at the Bass Museum’s temporary space. Rashaad Newsome discusses his procession as part of the Unrealism show in Miami. Trevor Paglen’s underwater dive during the fair week. Ann Craven’s I Like Blue show opens at Gallery Diet. Depart Foundation Miami’s WONDERWHEEL installation by Cura at the Nautilus hotel. Julian Schnabel’s speech during the Mr. Chow dinner at Mr. Chow. 2016 US presidential candidates fundraise during ABMB. Guns in the Hands of Artists show at Jonathan Ferrara Gallery brings gun debate to Miami. Gender-neutral bathroom appears at ABMB. Wyclef Jean kicks off the partying atmosphere in Miami for Basel. Swizz Beatz joins Simon de Pury and Daniel Arsham in panel about Instagram. Artnews covers Bruce High Quality Foundation’s Art Chopped competition at The Standard, Miami Beach. Artnet’s list of best Instagrams during the week. Art Basil occurs in LA during ABMB. Alanna Martinez claims Leonardo DiCaprio as her art world husband. The ten types of people at ABMB that are not there for the art. How Nina Agdal did ABMB. A summary of the best and worst of ABMB. Categories: Contemporary Art, Fairs, Low Brow & Pop Surrealism, Overtime, Street & Urban Art. 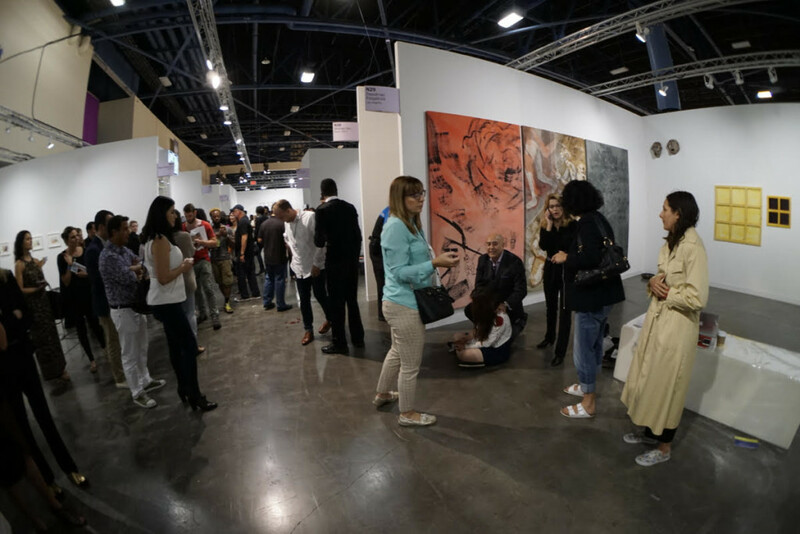 Tags: Art Basel Week Miami 2015, Art Fairs, Contemporary Art, Features, Low Brow & Pop Surrealism, Overtime, Street & Urban Art.